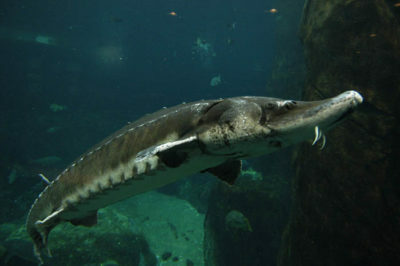 Atlantic sturgeon (Acipenser oxyrinchus) are long-lived and late maturing anadromous fish. They were once abundant and supported a large U.S. fishery. Due to significant population declines, a moratorium banning Atlantic sturgeon fishing was established in 1998. However, populations did not rebound. Consequently, some populations were listed as endangered or threatened under the ESA in 2012. Image credit: NOAA. Of the more than 33,000 species of extant fishes (www.fishbase.org), less than 1% migrate between marine and freshwater systems at different times in their life cycle (diadromous fishes). Many diadromous fish populations are at historic lows and are classified as threatened or endangered under the U.S. Endangered Species Act (ESA). Diadromous refers to fishes that migrate from freshwater to spawn in the ocean (catadromous) or migrate from the ocean to freshwater to spawn (anadromous). Salmon and sturgeon are two economically and biologically important, heavily regulated anadromous fishes. Significant declines in these fishes have been attributed to climate change, dam construction (habitat impediment), habitat degradation, overfishing, pollution, mining, and bycatch. One additional concern is the potential impact from anthropogenic sounds, such as those associated with coastal and offshore exploration and construction. However, at present there are no peer-reviewed studies that demonstrate these potential effects. Salmonid species on the western coast of the U.S. have experienced signficant declines over the past several decades. 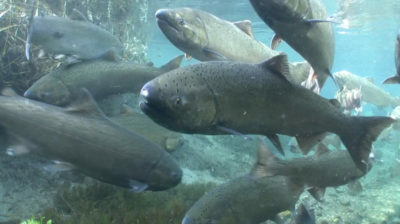 Nine populations of Chinook salmon (Oncorhynchus tshawytscha) are protected under the ESA. It is important to understand any potential stressor on these populations. Image credit: USFWS. Scientists and managers need to determine if fishes can detect the sounds in question. Sturgeon are not thought to detect sounds above 800Hz and are more likely to be responsive to the particle motion component of underwater sound rather than the sound pressure component. Lake sturgeon are responsive to sounds ranging in frequency from 50 to 500 Hz. Experiments have shown Atlantic salmon to be sensitive to particle motion at low frequencies, ranging from 20 Hz to 380 Hz. Much of the currently available peer-reviewed literature on the effects of sound on diadromous fishes is related to pile driving. The hearing range of both sturgeon and salmon overlap with the sounds produced by pile driving. In a recent study, sturgeon showed behavioral reactions to pile driving during bridge construction. Fewer fish were found in the vicinity of the piles when they were being driven. Physiological effects associated with noise exposure may also occur. To investigate the potential physiological effects of pile driving on fishes, several species of freshwater fish, including lake sturgeon and juvenile Chinook salmon, were exposed in a chamber to very high intensity simulated pile driving sounds. The scientists reported that injuries varied according to the total sound pressure received by the fish, the number of strikes, the species of fish, and whether a fish had a swim bladder. Injuries were only found when the received simulated sound energies were consistent with levels close to the pile driving. It is important to note that many studies of potential impacts on fishes have been conducted in a laboratory setting and research is still needed on free-swimming animals to determine the potential for injuries and behavioral impacts on fishes in the wild. In general, more studies on the effects of anthropogenic sound on diadromous fishes are needed. Animals and Sound: What are the potential effects of sound on marine fishes? Animals and Sound: How do fish hear? Animals and Sound: What components of sound are used for hearing?